Where:Allen E. Paulson Stadium, Statesboro, Ga. This is a must-win for both teams to win the Sun Belt East. Both teams are still contending with Appalachian State so the loser most likely will be out of the race to get to the first ever Sun Belt Conference title game. Troy enters this game as the lone undefeated team left in conference play in the Sun Belt Conference. The Trojans defense has been solid overall this year and the strength of the team in allowing 22.8 points per game. This ranks 38th in the country in all of FBS. Defending the run is their specialty, and because the Eagles run a triple option, the Trojans defense will be right at their specialty. Key Players: QB Sawyer Smith has settled in the starting quarterback role with five touchdowns (four passing, one rushing) and a 71.1 completion percentage in his last two starts. His favorite target WR Damion Willis has put up some of the best numbers in the country the last two weeks with 345 receiving yards and three touchdowns; the receiving tally is the third most nationally. With an offense that has been up-and-down this season, this duo will be key to Troy winning on the road. Fantasy Bonus Baby: RB B.J. 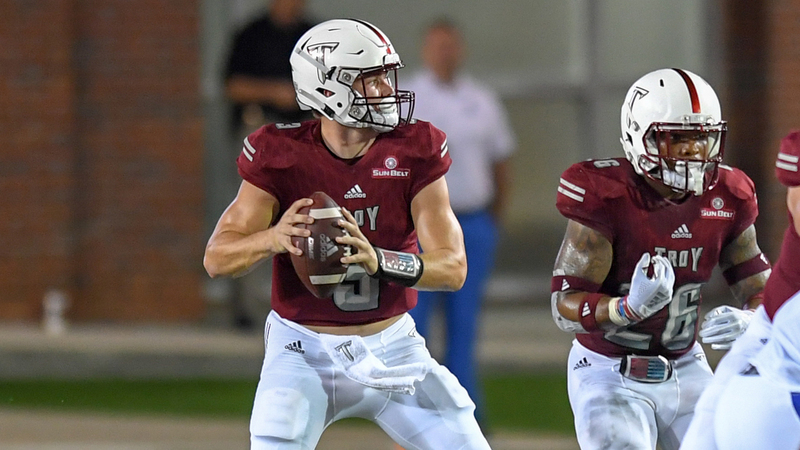 Smith etched his name into Troy lore after rushing for 103 yards and a touchdown last week in Troy’s win over Louisiana-Lafayette. He is now the only player in school history to rush for more than 100 yards in five consecutive games. Look for that streak to continue this week. After defeating Appalachian State two weeks ago, Georgia Southern had a big down fall last week in its loss to Louisiana-Monroe 44-25. The Eagles had been the hottest team in the Sun Belt prior to the loss in winning five in a row before this. he Eagles are dangerous at home with the second-highest home winning percentage among active stadiums across the country in FBS. Georgia Southern has posted a 192-39 in Paulson Stadium since its opening in 1984. Between the lines, Georgia Southern features the nation’s No. 8 rushing attack averaging 260.4 yards per game and boast the nation’s top turnover margin at +2.22 per game. Even with allowing 44 points last week, the Eagles points allowed per game average only increased to 21.4. The key to this game for the Eagles will be to shut down the Troy offense early in this game. 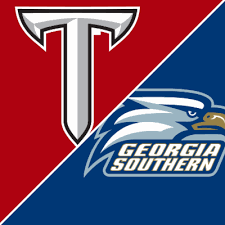 Georgia Southern and Troy have met 17 times on the gridiron with the Trojans holding an 11-6 lead in the series that dates back to 1934, although that number is a little misleading. Since Georgia Southern re-started its football program for the 1982 season, the Eagles are 6-3 against Troy, winning four of the past five but Troy won easily last year 38-16. Key Player: RB Wesley Fields is the key running back in the Eagles’ triple option attack. He is only Eagle to rank in the top 50 nationally with an average 80.4 yards per game on the ground. He has scored seven total touchdowns this season, one off his personal best of eight which he scored as a freshman in 2015. Fantasy Bonus Baby: Fields will likely lead the Eagles again this week in rushing and scoring. He will need to have a big game for the Eagles to come out victorious.